Veterans advocates say the nasty, personal attacks of the federal election campaign are driving an unprecedented wedge among the country's community of ex-soldiers, the likes of which haven't been since the 1920s. OTTAWA — An unprecedented political wedge is splitting the country's veterans, who are turning on each other in the countdown to the Oct. 19 vote in ways not seen in eight decades, say advocates and historians. Sean Bruyea, an outspoken critic of both Liberal and Conservative governments, says the last time veterans were so politicized and divided was in the aftermath of the First World War. "In terms of veterans attacking each other (politically), I don't think that has ever happened in recent memory," said Bruyea, who noted different groups have clashed over the wisdom of various policies, but the dialogue — while colourful — has never been personal. "It's really quite unacceptable." Historians Jack Granatstein and Desmond Morton both say the depth and fierceness of the political debate in the military community is not something that has been seen since the 1920s and 1930s, when hundreds of thousands of returned soldiers fought for promised pensions. 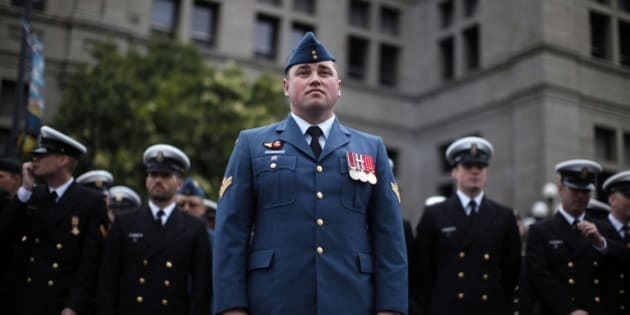 Today, a group of ex-soldiers, angry about closures of regional veterans' offices and fights over benefits, have — since before the Oct. 19 vote was called — waged an "Anyone But Conservatives" campaign to oust the Harper government. They are active online and are registered as a third party interest group for the campaign. Conservative candidate and Veterans Affairs Minister Erin O'Toole recently accused public service unions of funding the ABC campaign. Separately, other — sometimes high-profile veterans groups and advocates — have made no secret of their support for the Liberals. As the election has tightened, "Veterans For The Conservative Party of Canada" have launched a counterattack, claiming to speak on behalf of a "silent majority," who they say are happy with the way they've been treated. The organizer, retired warrant officer Lee Humphrey, says by not offering a specific alternative to the Conservatives, members of the ABC campaign are "cowardly." He later clarified the comment, online and in an interview Tuesday, saying it was not meant to question the physical bravery of soldiers but the "moral cowardice" of those carry out politics by stealth. But Bruyea says Humphrey's group ignores legitimate concerns over benefits and the treatment of the most severely injured, issues that have consumed the political agenda. "They're not dealing with the facts of the ABC campaign, the criticism of the way the government's handled the file," Bruyea said. "They're attacking these people personally and questioning their integrity as if they can't think for themselves,"
Humphrey denies that and says his group — formed on Aug. 19 — is "not trying to pretend the government is perfect" and has addressed issues on its Facebook page. David MacLeod, another ex-soldier, says he believes the Conservative war room orchestrated Humphrey's comments as a distraction, something Humphrey also denies. He said he's only been contacted by the party once, to verify he was a legitimate member and a former soldier. Morton said Humphrey's choice of words is significant. Using the word "cowardly" is coded language for the Conservative base, meant to paint those who disagree with the government's position as weak and unworthy, he said. It is not unlike the arguments Tory senators of the 1920s used to deny ex-soldiers suffering from First World War shell shock — or post-traumatic stress — a pension. "So, I think that Mr. Harper can guarantee — or his advisers can guarantee — that most Canadians of the age that vote Conservative, which is well over 50, will respond to this attitude and to these people and the firmness of the government in refusing to spend more of our tax dollars on their welfare," said Morton, who advised New Democrats in the 1960s and Brian Mulroney's Tories in the 1980s. Humphrey says "there's no code — or message to the base. It's clarity. ... It's about moral clarity." Although the active military steers clear of politics, Granatstein says there's nothing wrong with veterans becoming involved, especially when they believe there's a disservice being done. "Why shouldn't they be politicized?" he asked. "If you can't get the action that you as a veteran want by working behind the scenes, then you have no option but to go political." The timing — being so close to the end of the campaign — does not surprise Granatstein, who says the Conservative have been stung and embarrassed by the repeated criticism.